The Expenses tab of the Forecast Report helps you keep track of and estimate for your expenses. a. From the Project Page, click the View button on the Forecast Tool tile. b. 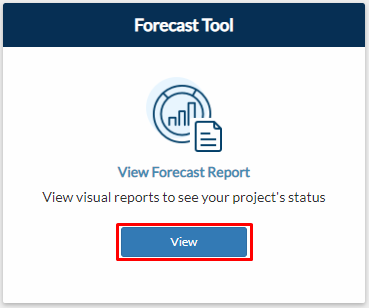 From the Project Dashboard, click the Reports - Calendar View button and select Forecast Report. c. From the navigation menu, go to Management > Reports > Forecast Report > Forecast Report > Forecast Report or just type in 'Forecast Report' on the search bar located on the upper right corner of your portal. 2. Select a project from the dropdown menu then click the View Record button. Note: This field is only visible outside projects. Inside the project, the Project Name is pre-populated. 3. Click the Expenses tab. a. Cost Centre. Your project work stages or milestones that you input in Price Breakdown and Variation Breakdown through the Project Breakdown populate this column by default in light blue rows. Expenses added through the Expense Form/Report that use cost centres apart from the ones used in the Price/Variation Breakdown also reflect here, in green rows. b. Contract Price. This is your budget for each of your Cost Centres. Your Contract Prices from your Project Breakdown reflect under this column by default. Expenses in green rows have $ 0.00 Contract Price by default. You can add a budget for each by directly typing in the amounts on the space provided. c. Current Costs. All expenses that you input through the Expense Form/Report under the Project Name selected reflect under this column accordingly. d. Amount Paid. All payments made to date for the expenses reflect under the Amount Paid column. e. Forecast Columns. This columns allow you to forecast or estimate for your expenses ahead of time. You can do that by simply selecting a Start and an End Date and then adding your estimates under the Estimated Subcontractor Contract Price column. The Current Cost column gets populated automatically depending on the period you entered through the Date Filters. 4. Click the View Cost Centre Details button to view your Expenses' and Payments' Breakdown per Supplier or Subcontractor. 5. 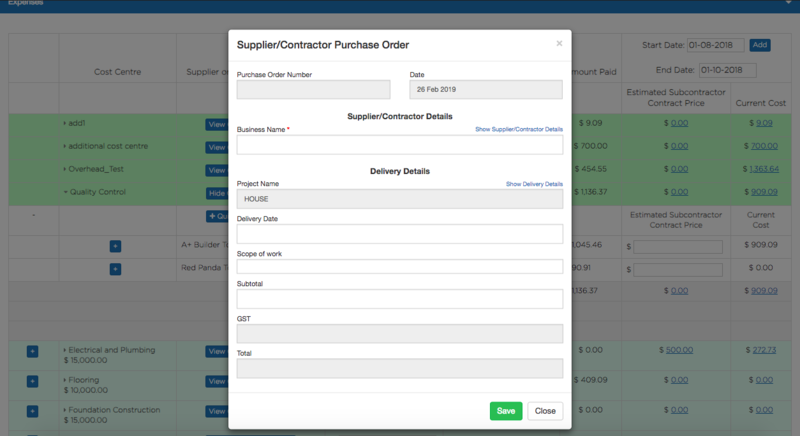 You can add your contract price for your subcontractors or suppliers under the Subcontractor Contract Price column either by directly typing in the amounts on the fields provided or by creating a Quick Purchase Order. 6. Quick Purchase Order. To create a quick purchase order just click the Quick Purchase Order button within the Cost Centres then fill out the form provided. There is also a button for Quick Purchase Orders below the table. 7. The total of your subcontractors' contract prices, current costs, and amounts paid are computed automatically per cost centre. Your Gross Margin is also calculated per cost centre. 8. You may add New Cost Centres directly from the table using the Add (+) buttons on the left of the Cost Centres.